A boutique winery in the southern Willamette Valley that released its first wines in September 2012 (2011 vintage) from vines planted in 2007. Production is very small, with a total of 300 cases in 2011 and 500 cases in 2012. 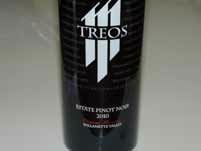 The wines have sold out to an avid fan base and through placement in a number of upscale Oregon restaurants. The lineup includes two Pinot Noirs (Founder's Reserve and Elegant Reserve), Pinot Gris-Muscat blend, Dry Muscat, Albarino, and a Port-style wine infused with roasted Oregon hazelnuts. Tasting in Monmouth, OR is available by appointment.